I am curious what an 8-year-old wants with thyme. 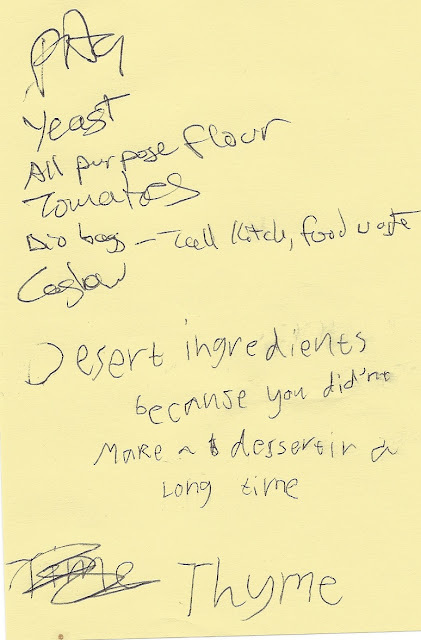 My 8-year-old son enjoys adding items to the shopping list. He also shrewdly understands that this is an important document that receives my close scrutiny -- so why not lobby for some home-baked dessert? There is the observation that his handwriting legibility has surpassed my own, but we've already covered that territory. His tactic is effective and I sense chocolate chip cookies or a strawberry rhubarb pie on the horizon. What the hell, it's Friday!